Moving an entire business from one location to another can be incredibly taxing on your body. In fact, moving is one of the most physically demanding activities that many of us will undertake at some point in our lives. Along with caring for all of the objects and personal belongings that allow you to run your business, it is also essential to care for the wellbeing of your body and back during a move. While we aren’t chiropractors or medical experts, we are expert commercial movers in Orlando with 50 years of experience in moving offices and businesses just like yours. We know better than most that accidents can happen, and about the importance of proper lifting and moving techniques. 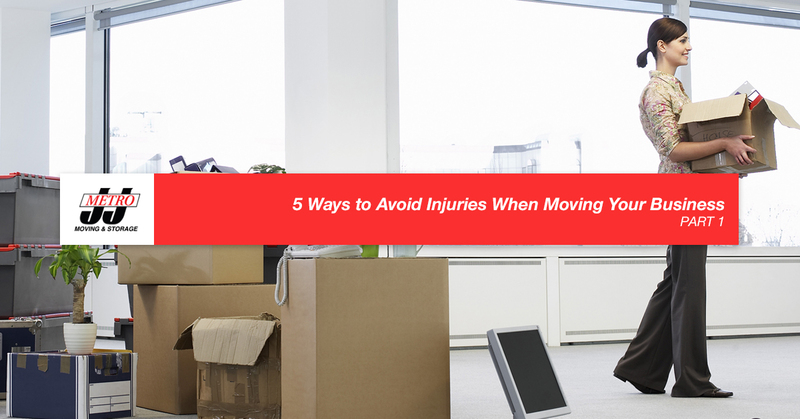 Therefore, in today’s blog post, we will be sharing with you five pro tips for protecting yourself from injuries while moving. And remember, when you want office movers you can rely on and trust to move your property safely and quickly, call J & J Moving and Storage to find out how we can assist you with your commercial move! When it comes to heavy lifting and carrying boxes, we know what a difference stretching can make. It’s best to warm up your muscles and get the blood flowing before you start the physical process of moving boxes in and out of a building and moving truck. When you start moving objects without stretching, you’re engaging the muscles and joints in your body without giving them a chance to warm up, which can lead to injury. We’ve seen it a million times. People moving their belongings in sandals and flip-flops is incredibly common here in sunny Florida. We get it — it’s hot and humid and wearing sneakers can be a real pain in this heat. But when you think about the possibility of dropping a heavy box loaded with books onto your poor little toes, or consider how many times you stub your toe when moving, the benefits of wearing comfortable, closed-toe shoes far outweigh that of wearing flip-flops. What’s more, sandals aren’t the most supportive when it comes to your ankles and arches. If step off of a curb wrong, there is nothing there to support the structure of your foot, which could lead to a painful strain or sprain. Additionally, wearing shoes with good arch supports and cushioning for your heels can actually support your lower back. Trust us, we know from experience! When you wear layered clothing, flowy dresses, baggy blouses, and other loose-fitting clothing, you’re at a greater risk of getting caught on something as you pass by. While you certainly wouldn’t want to tear your skirt or nice shirt, you also wouldn’t want to suffer an injury when your clothing gets caught on something causing you to trip and fall. Wear athletic clothing or clothing that is simple, comfortable, and fits tighter against your body. If anyone knows the importance of wearing a proper back support during a move, it’s us. Wearing a back support while you move boxes and other heavy objects helps stabilize your back and protect your lower back. It also helps you be more aware of your lifting posture, which is super important when you’re lifting, carrying, and setting down objects — heavy or not. The key is to wear your back support properly, ensuring it is the right fit for your body size, positioned in the right spot on your body, and fastened correctly for optimal function. But remember, a back support is not meant to replace your own physical strength and capabilities. Just because you’re wearing a back brace doesn’t mean you’ve suddenly been given superhuman strength that allows you lift more than you are capable of. That being said, it’s important to know your limits. Moving an office shouldn’t be a competition. Don’t lift more than you can handle. Avoid moving large items on your own and don’t attempt to carry boxes and other objects up and down stairs that are too heavy or awkward to carry. Only move what you are able to and don’t be afraid to ask for assistance. Sometimes, relocating a business is best left to the professionals. As the trusted office movers in Orlando since 1968, we have developed methods that allow us to move your belongings quickly yet in the most efficient and effective manner. We have the experience required for moving an entire business, whether it is a whole office, a warehouse, or simply a desk. Call J & J Moving and Storage today to see how our commercial movers in Orlando can assist you with relocating your business. Click or call us now to get a quote for our one-day moving services and let us tackle your move for you so you can focus on managing and growing your business. Tune in next time for part two of this short blog series to learn more ways to protect yourself from injuries during a move. Until then, thanks for reading!